Provides a default-gateway for the switch to send all unknown IP packets. Allows proper communication between switches and routers. 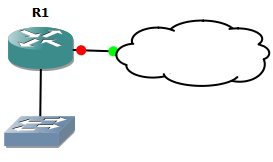 In the below example we will configure SW1 to use a default-gateway to ping R1’s loopback0. First, we will configure R1’s Fa0/0 and Loopback0 interfaces. Next we configure int VLAN 1 on SW1 so it can communicate with R1 via IP. Finally we configure a default gateway on SW1 so all unknown traffic is sent to R1. We then see that the ping is successful.